of May and we will pay for Mom! Do we have the WOW factor? We are always being complimented on our creative, artistic and unique rooms so we thought it’d be fun to celebrate with a fun competition by showing us your crazy, fun and unique side! 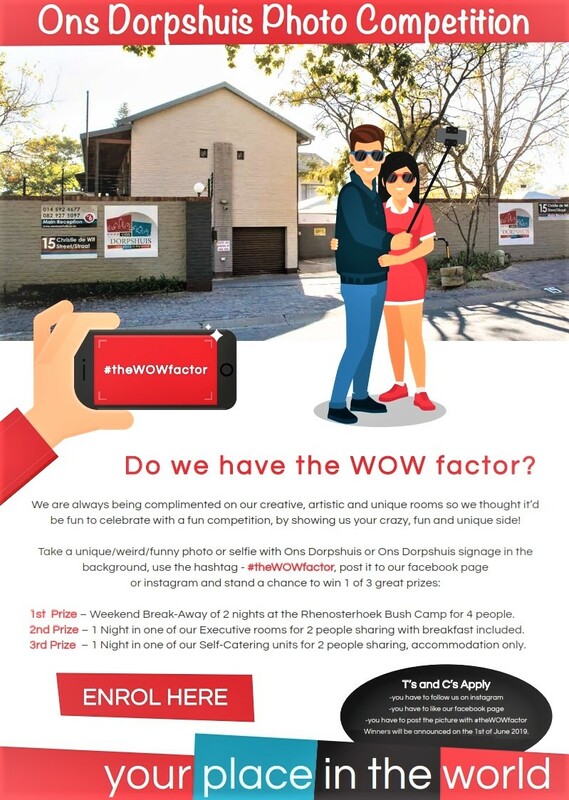 1st Prize: Weekend Break-Away of 2 nights at the Rhenosterhoek Bush Camp for 4 people. 2nd Prize: 1 Night in one of our Executive rooms for 2 people sharing with breakfast included. 3rd Prize: 1 Night in one of our Self-Catering units for 2 people sharing, accommodation only. Winners will be announced on the 1st of June 2019.